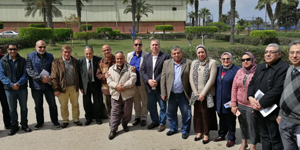 A delegation of the faculty of Engineering, headed by Prof. Mohamed Gaber Abou Ali, the faculty dean, paid a visit to the Egyptian Petrochemicals Company on Sunday, 24 March, 2019. The delegation was comprised of Prof. Mohamed Naeem, the vice dean and the head of the Basic Engineering Sciences Department and Dr. Abbas Anwar, a lecturer at the Petrochemical Engineering Department who were all received by the company vice chairman, members of the board of directors and some engineers. During the visit, the staff of the Egyptian Petrochemicals Company were provided with an introduction to the postgraduate programmes offered by the Petrochemical Engineering Department by Dr. Abbas Anwar who made a presentation of these programmes, including how they are in close relation with the petrochemicals industry and polymers manufacturing process.